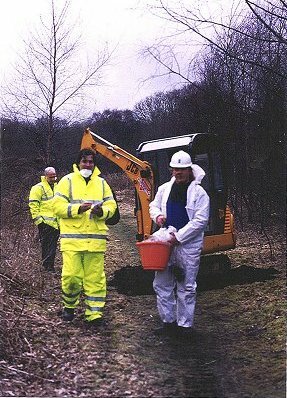 Contaminated land assessments - to measure the contamination risk to and from the archaeological resource. In particular, we examine the impact of industrial archaeology on the environment using our in-house targeted sampling methodology. Health & Safety assessments - to measure the contamination risk to archaeological and ancillary staff. We carry out Health & Safety assessments on brownfield and other potentially contaminated archaeological sites, using archaeological science techniques for evaluation. In this process, SASAA has forged strong links with world-renowned environmental consultancy company, Jacobs. Our context-driven technique involves on-site assessment of contamination in individual contexts over entire archaeological sites. We carry out a range of analytical tests, including elemental analysis. Following statistical interpretation of data, we provide detailed information to archaeologists and contractors of contamination 'hotspots'. We present our findings to clients in easily interpretable annotated section diagrams and animations. We also advise on necessary health and safety precautions based on contextual contamination.